Water will sit in the cracks and the cycle of freezing and thawing will cause them to get deeper and wider. Eventually water will be able to enter the interior of the chimney between the flue and the outer walls. This water will then damage the inside of the chimney and cause costly damage to the surrounding walls and ceilings in the house. Often times, when the chimney crown is broken it makes and excellent place for birds, squirrels and raccoons to make a home. 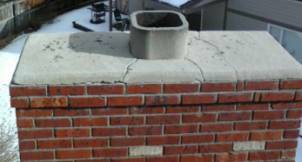 Some chimney crowns are in such bad shape that they must be torn off and completely rebuilt. However, if not allowed to deteriorate too far, most crowns can be repaired. We start by patching the cracks and deterioration with proper repair mortar or cement. We then cover the crown with a flexible waterproofing sealant that will protect it from water damage for many years to come. We use an excellent waterproofing product called CrownCoat that carries a 10 year warranty. 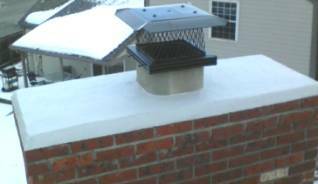 (For more info see: www.chimneysaver.com) This product can also be applied in cold weather making it ideal for use any time of year. Finally, we install a proper chimney cap on the flue to prevent water and animals from causing damage to the fireplace. Call Chimney Jack today for a free chimney crown inspection!